Granville, OH, January 27, 2017 --(PR.com)-- The Welsh Hills Inn has been named the #2 highest rated Bed & Breakfast/Inn in the U.S., and #4 in the world, by the 2017 TripAdvisor® Travelers’ Choice Awards, proud owners Bobbi and Jeff Noe announced today. They have been in TripAdvisor’s Top 10 for the past five years, including being named #1 in the U.S. and #5 in the world in 2015. Welsh Hills Inn has won TripAdvisor’s Certificate of Excellence every year since 2011, only months after opening, and has received their GreenLeaders Award for their environmental practices as well. In both 2013 and 2015, they were awarded the Ohio Hotel and Lodging Association’s B&B/Inn of the Year and, in 2016, they received the Explore Licking County Impact Award as the Lodging Partner of the Year. For 15 years, the Traveler’s Choice Awards have recognized the world’s top properties based on millions of reviews and opinions collected in a single year from travelers around the globe. Winners are named in the categories of Top Hotels, Bargain, B&Bs and Inns, Family, Luxury, Romance, Service and Small Hotels. The hallmarks of Travelers’ Choice winners are remarkable service, quality and value. Established in 2010, the Welsh Hills Inn is located just outside Granville, Ohio, 30 miles east of Columbus, and is owned and operated by Bobbi and Jeff Noe. Nestled on a hilltop overlooking its 15 acres of wooded grounds and the rolling hills of the Welsh Hills countryside, the Inn features over 5,600 sq. ft. of wide plank heart-of-pine floors, five large guest rooms, luxurious bedding, spacious bathrooms and cozy gathering rooms – decorated throughout with unique antiques, oriental rugs, and original artwork. Special features including an outdoor heated pool (May-early fall), state-of-the-art hot tub spa, courtyard gardens, a stone fireplace tucked next to the woods, a fishing pond, a lighted clay bocce ball court, outdoor table tennis and darts, and a target shooting & clays range provide ample opportunities for guests to stay active or relax and unwind. 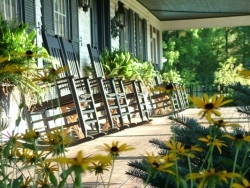 The Inn was honored as the Ohio Hotel & Lodging Association’s Ohio B&B/Inn of the Year in 2013 and 2015. The Noes welcome overnight guests and special events. TripAdvisor® is the world's largest travel site**, enabling travelers to unleash the potential of every trip. TripAdvisor offers advice from millions of travelers and a wide variety of travel choices and planning features with seamless links to booking tools that check hundreds of websites to find the best hotel prices. TripAdvisor branded sites make up the largest travel community in the world, reaching 390 million average monthly unique visitors*, and reached 435 million reviews and opinions covering 6.8 million accommodations, restaurants and attractions. The sites operate in 49 markets worldwide. TripAdvisor: Know better. Book better. Go better.